This classic Musical box is truly Romantic. 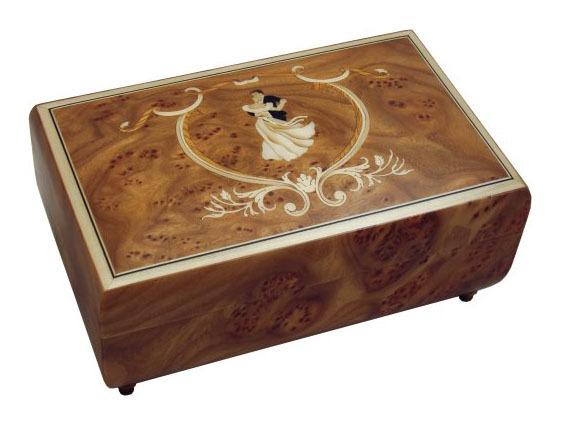 The hinged lid of this beautiful elm wood jewelry box features a traditionally inlaid pattern of a dancing couple. Lift this lid and watch the ballroom couple dance. It is a very lovely box that will be treasured. Guaranteed to please everyone...not just for youngsters! Plays Pachelbel's "Canon in D" or Rachmaninov's "18th Variation on a Theme of Paganini" You may order your preference when you add to cart. 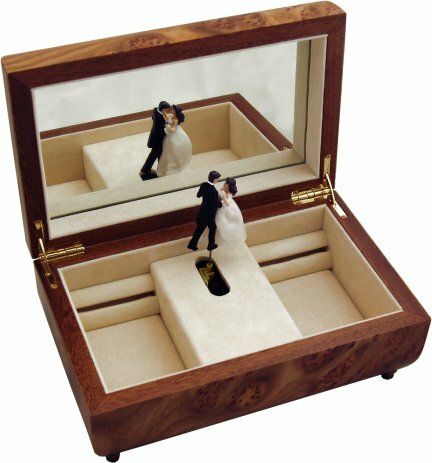 Dimensions: 8 3/4" L x 5 1/2" W x 3 1/2" H. Two 4" x 2 1/4" Jewelry compartments with ring bars to the left and right of the dancing couple.